Here is an entire list of the writing programs I'm offering at this time. 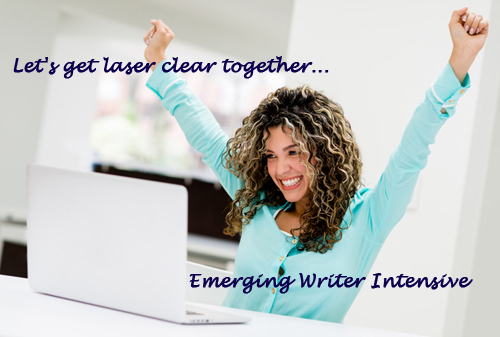 Let's get laser clear together... It's an opportunity to soar. We focus on your writing goals. This is a 4-hour one-on-one coaching session on Skype or Zoom platform that will set your goals in motion! Included in this intensive is a discussion on writing mindset, story development, and setting achievable writing targets. Also included are practical templates, tools, and insight for you to use as you continue on your writing journey. If you choose to fly to Southern Californa, we can expand the experience and really have some fun (email me for details and pricing on an in-person Intensive)!